I have a set of brand new 275/65-18's a friend gave me and was wondering if they can be used on my 2008 Aspen 4wb. I know my current size is 265/60-18 and want to make sure I will not cause harm to the vehicle or make it dangerous to operate. Running a different tire size, especially with that little of difference, is not going to cause harm to the vehicle or make it dangerous. As long as the tire is not too wide to rub finders (which would have to be pretty wide to rub ours). The main difference is the tire height. Any changes will affect the speedometer and odometer. Also, if you go REALLY big, it will affect your braking. 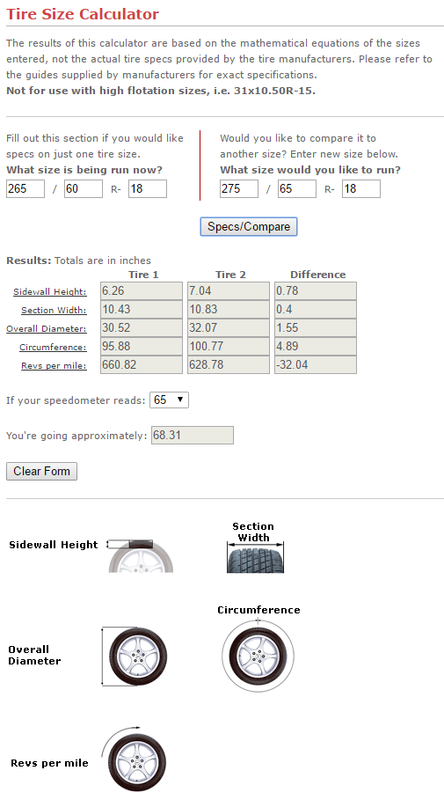 What you need here is a tire size calculator which is found at most tire websites such as this one Tire Size Calculator - Discount Tire Direct. I've already entered your information to break it down. Below is an screen shot of what I'm talking about. As you can see, tire 1 is your current size and tire 2 is your friends set. Sidewall height is just over 3/4" higher and overall diameter is just over 1.5" higher. Therefore when you are traveling at 65 mph on the highway (speedometer reading), you are actually doing just over 68 mph. So the biggest issue will be you running slightly slower than the speed limit to protect yourself. On the plus side, the odometer will register less mileage than you actually travel as well due to this difference. So you will reduce your mileage put on the vehicle. Last edited by calamity coyote; 05-12-2017 at 05:12 AM. man check here : Chrysler Aspen tire size for all wheels front and rear axles 2006-2009 | Cars Tire Size ? Dimensions For All Wheels Front and Rear Axles . you will find the answer. A/C O-rings, Can't find correct sizes! Can I use a 2005 2.7L in a 2001 ???? Quick Reply: Can I use different tire sizes?